Miller, courtesy of The Walt Disney Family Museum. 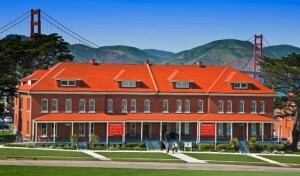 in a former army barrack on the Main Post in the Presidio of San Francisco, with the Golden Gate Bridge as a backdrop. San Jose State Design Professors Alice A. Carter and Courtney Granner were named co-directors of the Education Department at San Francisco’s Walt Disney Family Museum in January. The duo will be charged with ushering in the next significant phase of the museum’s education and public engagement initiatives. Co-founders of San Jose State University’s highly acclaimed Animation and Illustration Program, Carter and Granner bring decades of experience—in a variety of disciplines—to the museum. Their accomplishments include raising the bar for animation education at a major university, as well as helping launch hundreds of students into critical careers—students who are now influential animators, artists, designers, and thought leaders in a variety of industries around the world. Carter, who has been named an Outstanding Professor at SJSU, has also received a Fulbright Fellowship in Cairo, Egypt; the New York Society of Illustrators Distinguished Educator in the Arts Award; and the Umhoefer Prize for Achievement in the Humanities. “Walt Disney’s commitment to creativity and excellence has been an inspiration to me throughout my career,” Granner said, via the release. “I’m grateful for the opportunity to share that inspiration with others and to education our visitors about the artistry of Disney animation. Granner has received the School of Humanities and Arts Teaching Innovation Award and a Fulbright Fellowship in Cairo, Egypt. Both Cater and Granner have maintained a professional career while teaching. Read the full press release or visit the Walt Disney Family Museum website.